Wrong Turn At Tahoe is the kind of film people watch, because they see it's streaming. Compared to some of the other garbage that comes up while scrolling, this film actually seemed promising, but aside from a few interesting characters it wasn't. Joshua (Cuba Gooding Jr.) is the best middle man in the game, nothing gets past him, so when he hears that local drug dealer, Frankie Tahoe, has been threatening to kill his boss, he passes the information along. Together, they go to Tahoe's club and eliminate him, not realize that he works for Nino (Harvey Kaitel), the biggest boss in town. It's always great to see Harvey Kaitel playing a gangster, he seems to fit the role better than anyone else, and I wouldn't be surprised if one day it came out that he was the boss of a mob family. Aside from Kaitel and the mystery surrounding who Joshua is, this film was nothing more than a lot of shooting, bodies, and F words. I've said it before and I'll say it again, mafia movies may always be cool and popular, but it takes a lot more than F bombs and bullets to make a good film. 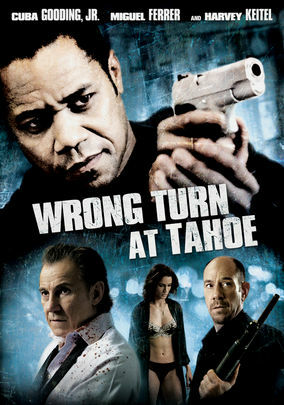 We've all seen films like Wrong Turn At Tahoe, there is a lot of arguing, a lot of shooting, and in the end, what was the point of any of it?